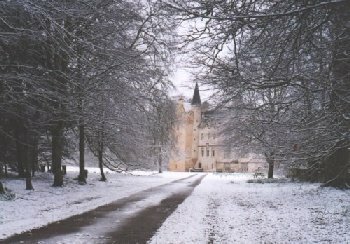 Brodie Castle is located 4.5 miles west of Forres and 24 miles east of Inverness on the east coast of Scotland. Having been badly damaged by fire in 1645, the castle was later rebuilt. The lime-harled building is a typical Z plan tower house with ornate corbelled battlements and bartizans. If you know where to look, you can see cannon drain spouts and a sun dial built into the side of the keep. Today you can visit in the interior with its unusual plaster ceilings and see French furniture, paintings, European and Chinese porcelain, Japanese artefacts, toys and much, much more. There are many rooms open to visit on several floors so you need to allow a good hour to look around everything. If you are interested in furnished interiors (as opposed to old castle ruins) then you will certainly enjoy your visit. At the end of your tour, don't forget to carry on through the tea room to the old kitchen and then when you exit the gift shop, the old dairy is outside to your left. There's also a picnic area, tea room and gift shop, adventure playground with timber fort for the kids, woodland walks, gardens and a lake. If you have chance to visit during the Spring, the famous collection of daffodils will be in full bloom. 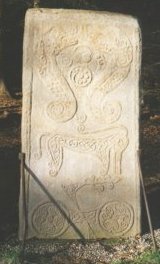 In the grounds there is a Pictish stone which was found in 1781 during excavations for a local church. It was moved here around 1840 and features various knots and sea monsters. This cross-slab of grey sandstone is known as Rodney Stone with varying stories as to the origin of the name. 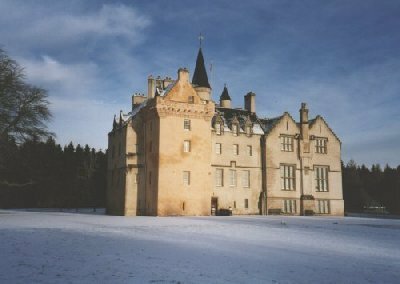 It is owned by the National Trust of Scotland - click here for opening dates/times. Admission charge. Last entry is usually about an hour before the castle closes. The grounds are open all year round every day. Tel: +44 (0)1309 641 371 / fax +44 (0)1309 641 600. Self catering accommodation is available - visit the National Trust of Scotland holiday accommodation web site for details. Various events are hosted here throughout the year including theatre, musical events, teddybears picnic, ranger walks, flower festivals. 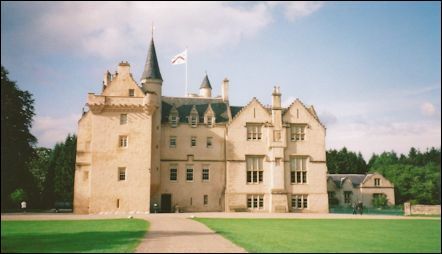 It was the home of Ninian Brodie of Brodie and family. The Internet Guide to Inverness and Inverness area: accommodation, sightseeing, transport, tours, etc. Hotels, B&B and self-catering accommodation around Nairn & Elgin. The Internet Guide to Scotland: comprehensive Scottish travel web site.